A selection of first-class offices is available to let along the motorway network and easily accessible. Provided with air-conditioning, 24/7 access, meeting rooms, kitchens, copy/fax facilities, cleaning service and parking facilities, they offer a professional and efficient working environment. This centre, based in Didcot, offers a number of different options for office needs. 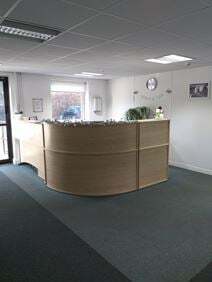 With a dedicated friendly reception service and an onsite centre manager, there is a team in place to take care of any issues or tasks you may need help with. The centre also has WiFi, shower facilities and tenants can have access 24 hours a day. The location of the centre is also a huge plus, as it is just a short walk to Didcot Parkway train station, which offers a fast service to London Paddington, allowing quick and easy access to the City for any potential meetings. These modern, managed units and offices are based on the Southmead Industrial Park, just outside Didcot. The centre offers space that can be used for offices, studios or workshops, which are air conditioned and maintained by the site's caretaker. The centre provides a selection of business services including access to meeting rooms and staffed reception to manage your incoming calls. The complex is available for tenant access 24hr and is very security minded.